`Tis the season to get crafty! Last week, I shared with you 10 Holiday Craft Ideas to Sell for Profit. Today, let’s find out the best places to sell your masterpiece. Although there will be numerous local fairs and events taking place in your community this holiday season, I’d still recommend selling digitally. Utilizing online marketplaces is a great way to earn exposure and make more profit. Don’t worry, you don’t have to build your own website. Below are six online platforms to sell your handmade goods and are perfect for small entrepreneurs like you. 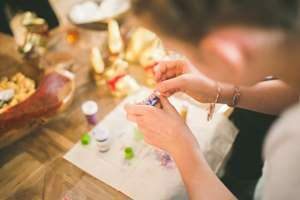 First on the list is an online retail site dedicated for buying and selling homemade products like crafts, jewelries, candles, quilts, paper print products, glass work and other handmade items. Signing up and Listings are free – but a 3% commission is charged on every sold item. This site is exclusively for handmade items too and not for mass-produced items. As soon as you sign up for a seller’s account, you get to have your own customizable stand-alone website and a store within Zibbet’s marketplace. Also, if you are already an existing Etsy seller, you can easily switch your listings to the site through a handy tool. Speaking of Etsy, this e-commerce site is really popular among hobbyists and professional merchants alike. It’s focused on handmade or vintage goods and supplies. Making an account is free but it requires a listing fee of only $0.20 USD for each item that you want to sell. Another 3.5% fee is again deducted once the sale is completed on the site. Storenvy is the only site that offers two ways to sell – a social marketplace to gain access to millions of built-in customers and a free custom online store if you want to build your own brand. The Marketplace works like Pinterest or Instagram, with over 65,000 merchants and millions of product listings. Both platform options don’t require additional fees for setting up a store or listing items, only a commission fee for every sale you make. This is a site specifically for artists and designers. You can upload your work directly to the site and it will automatically be available in different formats, including art prints, phone cases, clocks, mugs, shirts, pillowcases and more. When you sell a product, the company will produce, package and ship it for you and take a portion of the sale at the same time. Last is Handmade, Amazon’s dedicated hub for artisans to sell their unique, handcrafted goods to our hundreds of millions of customers worldwide. However, signing up is not easy. You need to get an invitation directly from Amazon or apply for one. When you submit your application, your products must meet their standards and guidelines to be considered. If you’re confident with your products, Handmade at Amazon is worth checking out.